When it comes to sappy science fiction Steven Spielberg opened and closed the book in 1982 with E.T. the Extra-Terrestrial, the story of a California family that takes in a friendly alien who was accidentally left behind by his space travelling partners from some unknown planet. Released just three years after Sigourney Weaver battled a terrifying space monster in Ridley Scott’s Alien, E.T. is the Casper the Friendly Ghost of science fiction. I was 16 year’s old when E.T. came out and I remember thinking it was sappy back then and watching it again this weekend did nothing to change my mind. Don’t get me wrong — it’s a cute film and that darn E.T. 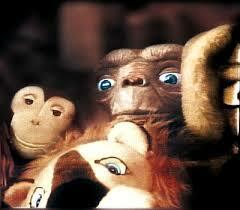 was so adorable (E.T. phone home! ), but in terms of the best films in American history I can’t agree with the AFI here. The film is ridiculously cliche and you know what’s going to happen all along. I’m not going to tear it apart — it is indeed iconic, but you know what I’m getting at. To say it’s predictable is an understatement. So how about some nice moments for posterity? The scene where E.T. hides in the closet among Elliott’s stuffed animals so the mom won’t see him is terrific. As is the scene where E.T. gets drunk on Coors and topples over in the family’s kitchen. And then there’s the adorable scene where young Gertie (Drew Barrymore) dresses E.T. up as a woman. And of course who could forget the scene where Elliott flies off into the moonlight with E.T. in a basket on his handlebars. Yes, iconic moments all. I’m not sure what Spielberg was going for here. His Close Encounters five years earlier was a much better alien movie, but perhaps he did E.T. simply so the kids who were too young to see Close Encounters could have an alien movie they could call their own. I will give it this though — the John Williams score is amazing and one of the best of his career — and it did indeed win the Oscar. Thank god the film didn’t, though it was indeed nominated for Best Picture for some odd reason (I think Gandhi might have rolled over in his grave had he lost the Oscar to this glorified after school special).